Detox Water Recipes To Lose Weight are easiest way out to cleanse and clear your body system, which will result in weight loss. Are you tussling with weight problems? Is your digestive system out of order? Or you are having skin problems, acne, pains? These are the common problems that arise in human bodies due to bad diet these days. Many of us adopt different diet plans to eliminate these problems from our life. The best, one can do is to drink plenty of water every day. 6-7 glass of water every day is a perfect approach to get rid of many digestive and skin problems. Drinking a lot of water help your body organs function properly. It keeps you hydrated and removes the toxic and unwanted substances from the body. I personally prefer to go for two to three kinds of detox water recipes to lose weight which I can have alternately. So, we all are aware of the benefits of drinking plain water, what if we still not get the output we need. In fact, there are lot more stuffs you can do to boost the effect of water. Like, you can add different things to your water to flush out the harmful substance out of your body. There are many ingredients available in nature that you can add to water to maximize its effect. These drinks are fast and easy to make and are easily available. The detox water benefits in many ways. 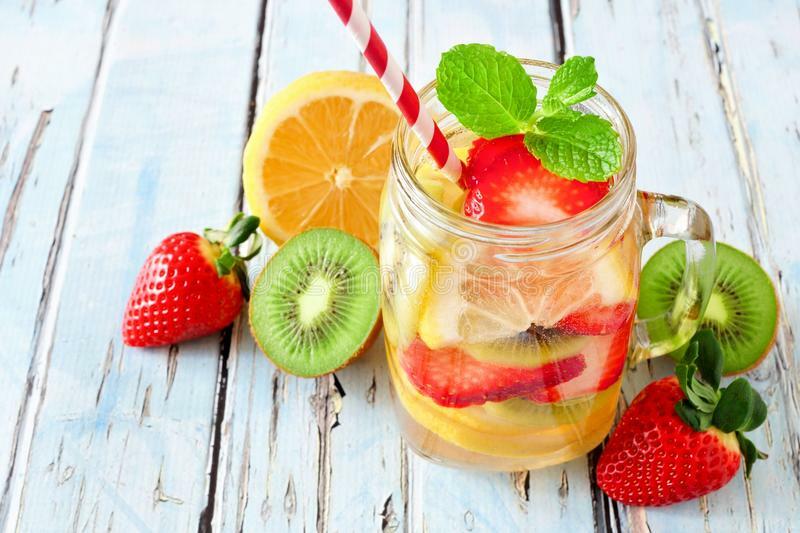 Now if you have tried all other means to dapper your physique and still suffer to lose weight, we recommend you to drink detox water for flat belly. If you are beginner then it’s a perfect recipe to start from. Simply combine cucumber with water 2-3 hours before consumptions. This stimulating beverage is bundled with fat burning enzymes which heal the digestive region. Alkaline properties of cucumber can help you stay cool and reverse acidic effects in the stomach. To boost its effect add limes and mint to it. Besides adding flavor to the drink, they also flush out the toxics. To observe the optimized result, drink at least half gallon of liquid ever day. It’s a best drink to start a day with. Lemon and Ginger’s unique benefits ensure a cheerful digestion. Adding ginger to it helps in battling cancer too. 12-13 ounce glass of water with freshly squeezed lemon and a half of ginger root lump is all you need. Ginger is great aid in digestion as well as prevention of cough and cold. The red drink is the latest drink trend which came with plenty of benefits. This juicy melon contains antioxidants (lycopene compound) which nurture anti inflammatory effects. It is best suited for the one who is indulged in daily fitness routine. Watermelon is refreshing way of welcoming health. Incorporating watermelon as a drink is like having a double treat. This drink is astonishingly packed with scintillating conjuration. All it requires two sticks of sugarcane, approx. 5-7 chunks of pineapple and 2 liters of spring water. Every sip of this mélange is delight to tongue and the meditative properties of ingredients are just icing on a cake. If detox is what you want, we are coming up with the range of informative articles on different detox. This also serve as a detox water for clear skin. Strawberry contains anti aging properties and remedy to encounter carcinogens. On other side kiwis are rich in vitamin A and E, which helps to eliminate toxins from colon and keep your body free from radicals. It is simple to make, you have to add chopped strawberry and kiwi in 2 liters of water and keep it in fridge for 2 hours to obtain a perfect tasty summer drink. We have tried to give some of the best Detox water recipes to lose weight, but there can be many preparations that you can create at home. You can keep on experimenting with different detox waters to ensure the best detox water recipe for weight loss suitable for you. Next articleWhat Is Reflexology – How Does It Work?